Source: Statistics Canada, Canadian Community Health Survey, 2009-2010. 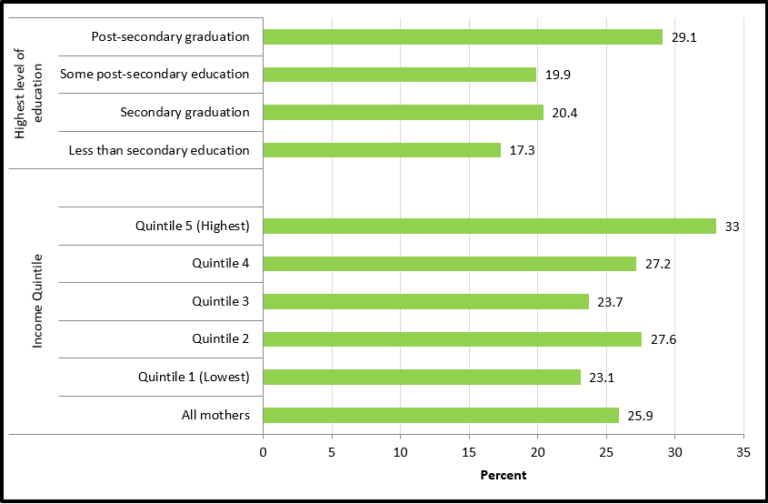 Canadian women who have graduated from post-secondary education were more likely to exclusively breastfeed for at least six months, 29%, than were those with less than high school, 17%, or high school, 20%. Canadian women in the highest income quintile were most likely to breastfeed exclusively for 6 months or more, 33%, than were women in all other income quintiles. Women who live in low income often have precarious employment without benefits. As a result they often have to return to work early. It is well documented that returning to work early has an impact on exclusive breastfeeding – women who return to work within the first 6 postpartum months are less likely to breastfeed exclusively for six months. Source: Al-Sahab B, Lanes A, Feldman M, Tamim H. Prevalence and predictors of 6-month exclusive breastfeeding among Canadian women: a national survey. BMC Pediatr. 2010;10:20. Published 2010 Apr 8.